De Bortoli – Windy Peak Pinot Grigio – A good value Pinot Grigio for under $15. Lawson’s Dry Hills – Marlborough Pinot Gris – Pear, citrus, a bit of spice, and well textured with a good length on the palate. Expected quality and taste from New Zealand. Ideal for under $25. 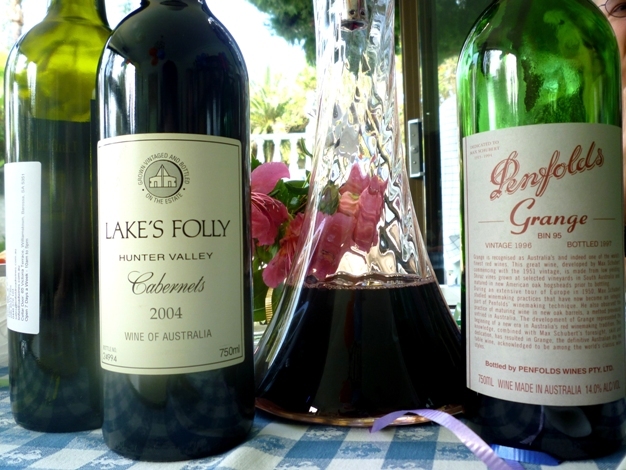 Lake’s Folly – Cabernets 2004 – From the Hunter Valley – a very elegant, deep and intense wine that can still cellar further. Has really smooth, clean edges, and a powerful, yet not too heavy, body (think dark berries, cassis, herbs, well integrated oak and silky tannins…). A collectable wine. Perfect with a medium-rare steak and roast vegies with caramelised balsamic vinegar. Rrp about $52. Penfolds – Grange 1996 – One of the best vintages of all time (Aus), along with 2002, 1998, 1991 and 1990. Still after 14 years this wine needed more time, but was still delicious now. Luxurious palate but not overly heavy. Plums, red cherry, oak, and silky smooth, velvety tannins. Will drink until about 2025… A collectable wine. Rrp currently around about $550. Kemeny’s – Hidden Label – Cowra Cordon Cut Sauvignon Blanc Semillon – This Kemeny’s clean skin (unbranded) dessert wine is fantastic value for money… I bought dozens a few years ago and these sticky wines never let me down. Orange blossom and honey… Went perfectly with Tiramisu cake and vanilla ice cream. Rrp under $20. Great value! Wow! Must have been a pretty special BBQ! Amazing wines! Just found your blog- love it- Have a 96 grange left behind in storage in Australia, have often wondered when we should crack it… thanks for doing the leg work! Sounds like my kind of bbq….